We were very lucky to link up with Northland weavers, Mandy Sunlight, Ruth Port and Rouati Evans during their short stay in London. The weavers were here to research and learn from Te Ra, the only known woven maori sail still in existence; Located at the British Museums Oceania Object Stores in Shoreditch, East London. Mandy, Ruth and Rouati were greeted at Moku HQ with a full house of wahine ready to learn basic weaving skills from them. During the weaving workshop, the roopu te wahine were encouraged to create bracelets, earring and kupenga taonga (necklaces), all varying in skill levels from simple to more complex. 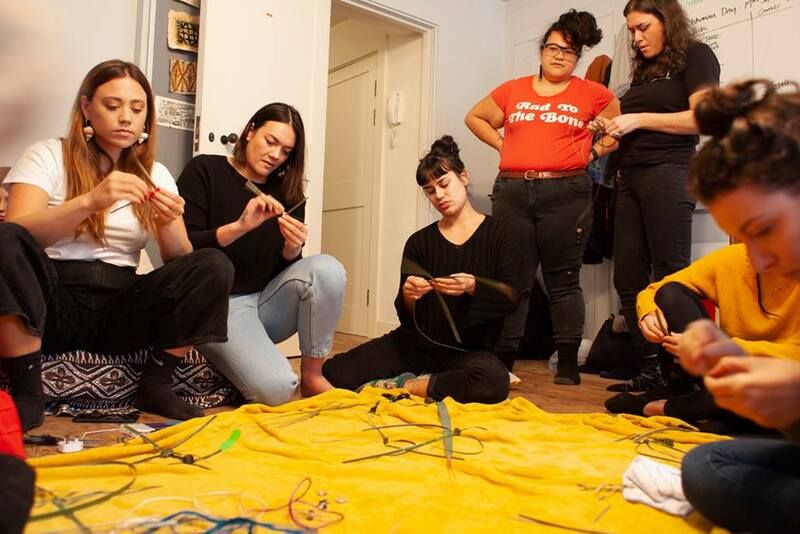 The afternoon was centered around whanaungatanga, sharing of stories and learning together as wahine from all around Te-Moananui-a-kiwa; as well as ideas of reclamation of traditional techniques in a modern context, sparking new ideas on cultural adornment and expression.